History was made at Aboyne Golf Club yesterday after the course record was broken after a 24-year wait. Playing in the second round of the Club Championship, Craig Stephen (+1 handicap), shot a 61 to shave a stroke off the record set by Colin Forbes in 1994. 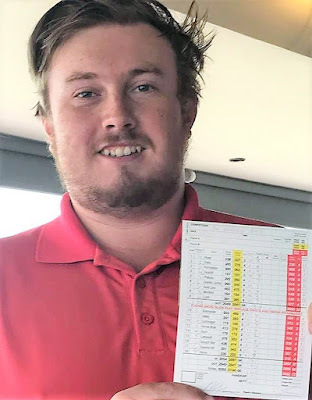 Craig, a recent graduate from Brevard College in North Carolina, said "It felt like a normal round to start with, making 4 solid pars then birdied 5,6 and 7 and that got my attention. Further birdies at 9 and 10 really got me thinking about the record and once I hit the 11th fairway I said to my playing partner Brian that this is my best chance to do it. I birdied 14 and 16 to get to -7 and then made 2 solid pars to finish." Craig went on "Shooting the course record at Aboyne has always been one of my goals and to finally do it I am very pleased. It was nice to get a little note from Colin last evening congratulating me too. The course is in fantastic condition and the greens are just sublime all down to Colin and his hardworking team of greenstaff." +Colin Forbes (Aboyne GC's Head Greenkeeper) was the previous record holder scoring a 62 on 21st July 1994.